Papaya is known for the enzyme papain, which assists the digestion of proteins, as well as other enzymes that help the body digest and utilize important nutrients. Papaya is rich in beta-carotene (vitamin A) and flavonoids, as well as folate, potassium, iron, calcium, B vitamins, and the antioxidant vitamins C and E. It is also a good source of dietary fiber. The beta-carotene and other vitamins in orange-colored Papaya fruit may help protect normal eyesight, and its unique enzymes may aid digestion and promote gastrointestinal health, particularly colon health. In addition, it may help maintain normal cholesterol levels. 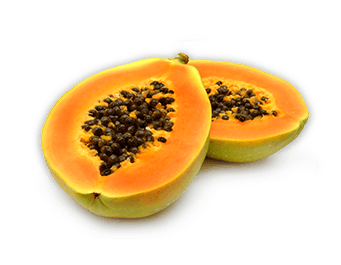 Papaya is also used to support cardiovascular function and promote a healthy immune system.